I am always keen to review Business Class seating on the latest planes and the new Singapore Airlines Airbus A350-900 is no exception. This new aircraft features a three-class configuration, with 42 seats in business, 24 in Premium Economy and 187 in Economy. However, the first tranche of A350s will be followed by a wave of ‘medium-range’ models from 2017 with less emphasis on premium seating. The A350-900 will eventually replace all of Singapore Airlines’ A330s on flights of up to eight hours. If you’re going to book a business class ticket, you are essentially paying for the added comfort of space to lie flat as well as extra privacy. The seats on the Singapore Airlines Airbus A350-900 really do tick all the boxes. You can read my most recent review of my Singapore Airlines flight on the new A350-900 in Business Class from Düsseldorf Airport (DUS) in Germany to Changi International Airport (SIN). Their large, luxurious seats offer loads of space. Framed in a metallic copper, the 30? wide seats convert into 78? long beds. Add in delicious mood lighting and quilted and stitched leather seat backs, and there is no question that this is a luxury experience, probably one of the best business class products in the skies. The seat layout is 1-2-1 so there is plenty of room to breathe. The seat “head-wings” offer a decent privacy block from your neighbour and the seats are staggered slightly which also increases privacy. There are a number of lights in your seat area, each with two different intensities, enabling you to create the perfect light intensity. Above the seats, you will find a storage hole for newspapers & magazines, a personal reading light and a port for headphones. Just below is a USB and power socket. In front, there are more storage spaces and shelves. To the side of the shelf is a useful mirror, which is fully lit. As you would expect, the seat is very comfortable and offers a wide array of reclining options so that you can find the perfect position. To convert your seat to a bed, it folds down, filling in the gaps and turning into a 78? diagonal bed. This is the widest business class seat in the sky and weirdly when it turns into a bed it flips over. This means that you sit on a leather seat to sit up but sleep on a cotton mattress. Unless you choose a seat at the front of the cabin, your feet will need to fit into a cubby hole to one side of the seat in front when you sleep, which forces you to sleep at an angle across the bed. Having said that, the bed is comfy and the sleep is good. The airline also uses lighting to great effect, with spots and pools of light subtly giving the cabin a softer feel. The Singapore Airlines staff are also consistently excellent so expect excellent onboard service and a recommended business class experience. What Is The Best Business Class Seat On Singapore Airlines Airbus A350-900? 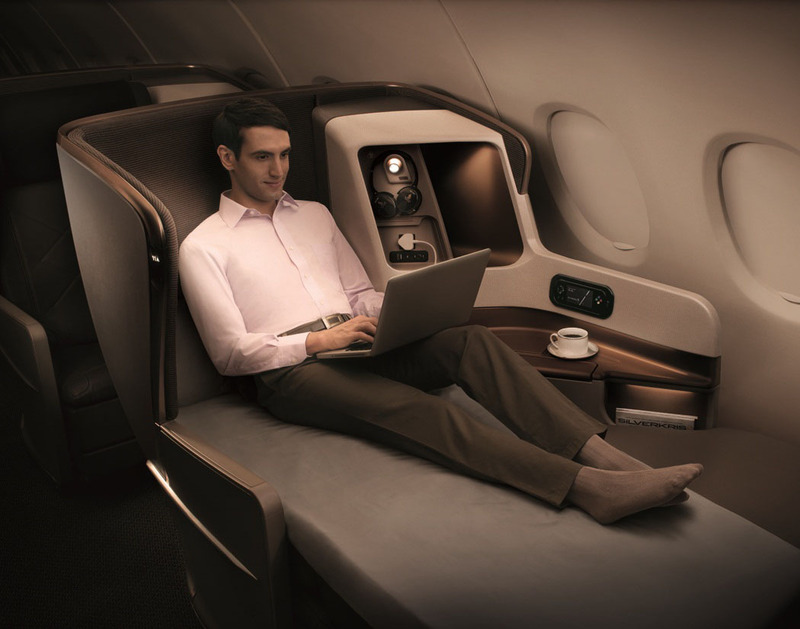 The business class seating on the Singapore Airlines Airbus A350 is set up in a 1-2-1 configuration. I think rows 11 A&K are the best seats. These are at the front of the front cabin of the business class section of this A350, right by the exit and the furthest away from premium economy and economy. All seats in A&K sit on their own and have a window. If you are travelling as a couple you may prefer 11 D&F which sit in the centre of the plane next to each other. There is not much to choose between rows 11-18 as there is a toilet and galley at both ends of this cabin. It is worth noting that row 19 has baby cot space so this is a good row if you want more space but you may be placed next to an adult with a baby. All seats in rows 19-22 fall in the more child-friendly cabin. What Is The Best Premium Economy Seat On Singapore Airlines Airbus A350-900? In my review of Premium Economy on Singapore Airlines Airbus A350-900, I would describe the space as “intimate” with just 24 seats, arranged in a 2-4-2 layout across three rows. Each seat is 18.5-inches, (same as those on SIA’s B777-300ER but Premium Economy on Singapore Airlines A380 has a 19.5-inches). Features include a 13.3-inch HD touchscreen monitor (billed as the largest in this class of travel), complimentary champagne, as well as SIA’s “Book the Cook” service. In my opinion, seats 31 A&K are the best options in the very small, premium economy cabin on the Singapore Airlines Airbus A350. These are by the window, are at the front of the premium economy section and are not too far from the emergency exit. What Is The Best Economy Seat On Singapore Airlines Airbus A350-900? Singapore Airlines currently use Krisworld as their in-flight entertainment system with a plentiful selection of channels and offerings. The Singapore Airlines Airbus A350-900 will arrive in Singapore’s Changi Airport on Thursday March 3 as the centrepiece of a fleet upgrade for Singapore Airlines, with 63 firm orders and options to buy 20 more. The inaugural A350 commercial services will make short hops from Singapore to Kuala Lumpur and Jakarta for the purposes of crew familiarisation before spreading their wings onto the 13-hour Singapore-Amsterdam route. The first regular scheduled service will see the A350 deployed on the Singapore–Amsterdam route in June, followed by flights to Dusseldorf in July. Next up will be the ultra-long range Airbus A350ULR to fly non-stop from Singapore to Los Angeles and New York. This will sport a premium-heavy layout of around 170 seats, expected to be a mostly business class configuration bookended by small first class and premium economy cabin.